It’s Christmas. Some people probably got unwrapped gifts ... as you can see, I got an ungifted wrap. I fell coming out of a store in Concordia when a leaky gutter led to a frozen patch that wasn’t visible at my angle of approach. Initially, the little bump on my knee and my pride hurt more than did my wrist or hand. My concern involved my clothing more than my bones and muscles. I landed almost flat on stomach and chest and my black clergy shirt was light brown and grey from the salt and dirt on the parking lot. Only later, after the children’s program, did any swelling or increased pain evidence themselves. We came back home and I cooked spaghetti while stockings were hung by the chimney with care from the beam between the living and dining rooms, the tree trimmed, and the final packages wrapped. After eating with The Fair Stephanie™, Laura, and Ryon, I started helping with some house work. Then, as is our custom, we opened a few gifts. When tears came from the pain of tearing wrapping paper, I decided to visit the ER at the Sweet Springs hospital. Unlike what happened at the end of last year to my Beloved, nothing broke. We had to wait for the radiologist and all the other fun activities of a small town ER on a Christmas Eve. 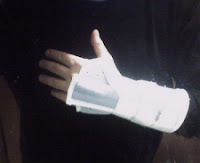 Still, I enjoyed talking with the doctors and nurses and got to bring home this neat splint as a souvenir. I thought I would show you my picture and wish you a a blessed Feast of the Nativity’ because He’s the Gift always worth receiving.